POND ISLAND, Sint Maarten – The Department of Statistics (STAT) from the Ministry of Tourism, Economic Affairs, Traffic & Telecommunications, embarked upon an Economic Census Survey (ECS) back in May and has received information from more than 1400 entities. “I would like to encourage the continued cooperation and participation of the business community with respect to the ECS. “This information is very important as it helps Government and other entities understand the current situation of the national economy and plan accordingly. “The information is also very valuable for such international entities as the International Monetary Fund and the World Bank. “The full cooperation of the business sector is necessary in order to have a complete picture of the state of the economy. This information allows Government to strategically plan and develop policies. 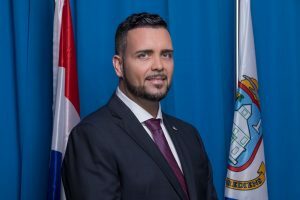 “I take this opportunity to thank those businesses who have already participated in this process,” Minister of Tourism & Economic Affairs Stuart Johnson said on Thursday. The ECS is an internationally used exercise to collect and report on the number of business establishments according to their size, economic activity/industry, and location. STAT will also be able to identify and report on the number of micro, small, medium and large entities operating on St. Maarten. Nine interviewers have been busy canvassing business operations in eight zones namely, Low Lands, Simpson Bay, Cole Bay, Little Bay, Cul de Sac, Philipsburg, Upper Princess Quarter and Lower Princess Quarter. The ECS is being carried out over a 10-week period and started in May 2018. This survey is a main data source for: 1) Creating a comprehensive Statistical Business Register system; 2) Calculating more accurately the Gross Domestic Product (GDP); 3) Obtaining data on the number and distribution of economic establishments by industrial category, region and number of employees.